Chris - This week, we're at the British Society for Gene and Cell Therapy's Conference at Royal Holloway University in Surrey. Earlier today, I spoke to the society's president to find out a bit more about the purpose for today's event. Adrian - I'm Professor Adrian Thrasher. I'm a Consultant Immunologist at Great Ormond Street Hospital and I'm currently the President of the British Society for Cell and Gene Therapy. This is a meeting that the society holds every year throughout the country. What we try and do is bring together a group of scientists to discuss the latest advances in gene therapy. And actually, one of the innovations we've had this year is to try and bring the stem cell community together because we feel that there are considerable synergies between the two parties if you like. Chris - I did my PhD in gene therapy and most of the things that we were writing about were things that were very speculative and in the future. The thing that's really striking me from being here is scientists are now saying at this meeting, we are doing those sorts of things we dreamed about 10 years ago. It's really coming to fruition. Adrian - It is no question. I mean, there are a number of different diseases, both rare diseases and more common diseases including cancer that are responding well to the new genetic therapies. So, the question has changed from, can we do this in a few diseases to what other diseases are targetable by gene therapy or cell therapy? Chris - What are the really big announcements or the really big developments that are being championed here at the conference? Adrian - It's difficult to pin down single advances because there are actually large numbers of what we would think of as big advances. So the new diseases that are responding to treatments, rare hematologic diseases, rare metabolic diseases where patients are having sustained lifelong benefits. In the cancer field, we're seeing patients with leukemia responding incredibly well to redirect a T-cell therapy for example. So, there are lots of huge advances. Chris - Well, let's hear about some of those advances. Kate Lamble has been speaking with Steve Hart who's from UCL and works on cystic fibrosis. Steve - Cystic fibrosis is caused by a genetic mutation in a gene called the cystic fibrosis transmembrane conductance regulator, CFTR for short and it affects a number of organs - the lung, liver, gut, pancreas, and the major health problem in cystic fibrosis is the lung. So, patients that have very thick mucous lining the airways and that leads to bacterial infection. Bacterial infection leads to inflammatory response and that exacerbates the damage to a lung. So, the long term prospects are one of a slow loss of lung function. 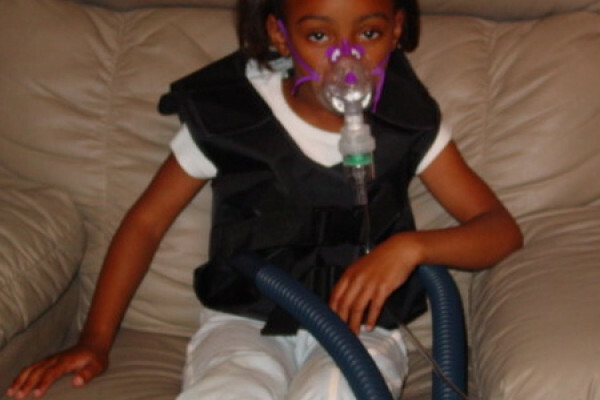 Gene therapy, which I started working on - now, this is my 20th anniversary of trying to develop gene therapy for CF. So far, unless we hear something new and exciting at this conference, there hasn't yet been a report of anything therapeutic. Kate - So, in gene therapy, you're hoping to replace this mutated gene in people's cells. What's the best way of getting that gene into those cells? Steve - The challenges are to get the gene to the correct area first of all. The lung has an enormous surface area equivalent to at least Wimbledon tennis court and so, whereabouts in that huge area have you got to deliver your genes is obviously a big challenge. We've taken that that site of delivery should be the site where CFTR is normally expressed within the lung. And that happens to be in the trachea, the bronchii, and the bronchioles which are together known as the conducting airways. So, delivery to the conducting airways is the challenge. Once you get there however, the next barrier is the mucous. So, how to get through the mucous. So, even then if you get through the mucous, the barrier below that, you have cilia which are these small hair-like projections which are highly motile and moving very rapidly, all in one direction to sweep out particles from the lung. And only last year, it's emerged now that there's another protein mesh between these cilia which excludes particles, any larger than about 20 nanometers. So essentially, it's able to exclude even viruses. But we take hope from biology where we know that people do get respiratory infections. Kate - It seems quite odd to take hope from people getting respiratory infections. How can you replicate those infections in order to transmit the gene into the cells? Steve - So, viruses, you can think of them as biological nano particles - very well adapted, very efficient at getting genes into cells, the sole purpose of making more virus. So, if we can develop synthetic nano particles that look like viruses and have some of the functions that enable viruses to get into cells then maybe we can develop a more efficient system. Kate - It's one thing getting a gene into a cell and you've talked about how difficult and how many barriers there are to that in the lungs, but it's another thing to make sure that that gene, once it's in the cell is used and expressed. How do you make sure that that happens? Steve - Genes usually come in a piece of circular DNA called a plasmid and these plasmids can be switched off very rapidly. To grow a plasmid, it needs to be amplified by growth in a bacterial culture. So, as the bacteria grow, so the plasmid replicates inside cell. So, you need switches and regulatory elements to control making more copies of the plasmid DNA and a selective force needs to be applied as well so that the bacteria need to keep that plasmid in a high copy number. And that selection is usually an antibiotic, so there is an antibiotic resistance gene on the plasmid. So, that's only needed for growth in the bacteria. So, once you come to put your DNA construct into humans or mammalian cells, you don't need all that bacterial stuff. It's now junk. And actually, it can be quite damaging to the treatments. There are certain sequences of DNA that are recognised as foreign by a mammalian cell and it will cause quite a strong inflammatory and immune respons. So, we've been developing mini circle technology for delivery to the lung. We're not aware of any other group that's done this yet, but I'm going to be presenting some of the data of this conference. The idea of mini circles was to use simple recombinant DNA technology so you can still grow up the plasmid in bacteria to get large amounts of it. But then you can give them a further treatment so that they essentially loop out the region containing your gene and your mammalian switches that you want to keep. So, you end up with a mini circle that is much smaller because it doesn't now have all this bacterial junk.It's much less inflammatory and per weight of DNA, the benefit is that you've got more copies of the gene of interest. In our In Vivo studies, we've found that for the same weight of DNA, compared to a plasmid on mini circle will give nearly 10-fold higher level of gene expression. And at the moment, for CF, expression is the name of the game. What about the epigenetic effects of gene therapy?